← Q: Should I sleep-train my baby? Would you like to give birth in the warm waters of a secluded bay in the Black Sea surrounded by caring friends, family and friendly dolphins? Don’t worry if it’s not your cup of tea – ‘conscious childbirth’ pioneer Elena Tonetti-Vladimirova, says that the Black Sea and the dolphins are not essential to create a good birth. There are other things we can do that are more important. It began Russia in the 1980s. Hospital conditions in Moscow were atrocious says American midwife, Barbara Harper. Birthing women were being mistreated and abused, fathers were excluded and babies were separated from their mothers. So a ground-swell movement began. Women started giving birth at home, often in their own bath-tubs, assisted by other women. These women described themselves as ‘spiritual midwives’, because birth is an experience that impacts us deeply on all levels and has the power to transform our lives. As the movement grew, summer ‘birth camps’ were organised at a secluded bay in the black sea. There young families gathered and women gave birth to their babies in the warm waters of the rocky pools and inlets, supported by their midwives and families. Meanwhile adults, older children and even toddlers under supervision, dived and swam under the water in the bay, joined the wild dolphins. Families were free to come and go as they needed. They brought their own supplies, bought essentials at the nearest farmer’s market, fetched water from a nearby spring, planted vegetables and shared their skills. Pregnant again herself, midwife Tatiana Sargunas helped deliver other women’s babies, while her own toddlers swam in the water nearby. When winter returned, the mothers and midwives returned to Moscow and the babies were born in birthing pools at home. We heard rumours at the time about babies being born in the warm tidal pools in the Black sea and were unsure what to make of it, but the ideas began to seep through to the West. Michel Odent offered waterbirths at his clinic in Pithiviers, in France. In California, ‘alternative birth centres’ started including waterbirths as an option. Soon hospitals around the world were installing birthing pools for women who wanted to give birth as naturally as possible, and found that relaxing in warm water often gave effective pain-relief. 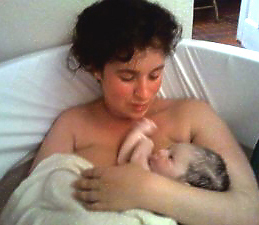 Today waterbirths are well known and take place in hospitals and birth centres in many countries. Private midwives offer waterbirth options at home and in hospital. The fluid element of warm water creates a very supportive ‘birthing field’, which allows the mother to attune to the primal rhythm of life, says Elena. In most cases, water is helpful as it allows the mother to relax and gain her composure if she is getting tired in labour. However, just placing a woman in water doesn’t make it a conscious birth. Conscious birth happens when we have cleared away anything negative that is holding us back and can let go completely. About 4% of all women naturally give birth easily and without pain. The rest of us have to work on it, which is why early preparation is so important. By the time of the delivery the mother needs to be in touch with her own inner strength and release everything that has been holding her back from letting go fully, Elena says. This includes dealing with any negative feelings about her body and sexuality. Ideally, an expectant mother should feel supported and be treated with great care by her friends and family. The mother needs to give birth in a safe, quiet place, supported by the people to whom she feels the closest and with whom she feels the most at ease. That could be her partner, close women friends who have given birth themselves, or even her own mother. Whoever is present, should also have cleared any negative experiences they may have about birth, so that they can stay relaxed and have a calming effect on the mother, supporting her completely. A prepared father can be wonderful birth partner. He can be in the water with the mother, caressing and holding her, and she can lean back into his arms for support. Stroking, kissing and cuddling are soothing to her and help the mother make the hormone oxytocin, which has been called the ‘love hormone’. This hormone makes us feel good and also keeps the contractions coming steadily, helping the baby to be born. In medicalised birth, artificial oxytocin (syntocinon or pitocin) is often given to mothers to speed up labour. But too much syntocinon creates very strong contractions that are painful for the mother and stressful for the baby, often necessitating obstetrical interventions. Allowing mothers to make their own, natural oxytocin is much safer. Preparation for the birth is very important and should begin early in the pregnancy, and optimally even before conception. Good preparation includes both physical and psychological processes, which help the mother and father recognise and heal any birth and childhood trauma they may be carrying. If the mother went through a difficult birth herself, going into labour can trigger that deeply buried body memory and affect how she gives birth. Healing these traumas before the birth is important and is something Elena addresses in her workshops. She attempts to ‘create’ a good symbolic birth experience involving all three levels of the brain. So she uses touch, sound, movement, dance, vocalising and relaxing techniques that help mothers and fathers to get more deeply in touch with their bodies and their feelings, in a positive and enjoyable way. When couples give birth together in water, they work intuitively together with each other and with the baby. Some of them describe labour as ‘pain that doesn’t hurt’. “Being in the water allows the mother to relax and let go of her mental control and inhibitions, thus yielding to the sexual energy that birth creates. “The beauty of these births is that both mother and father are totally ‘present’, which allows the mother to feel relaxed and safe in his arms. They both trust that her body knows what to do. There is no talking. Giving birth is not a mental activity”, says Elena. “For the most part I was squatting and as it got more intense, I would stand up and ‘spiral’ my hips and work with the energy”, says Amber. “So much energy was collecting in my hips, all I could do was just spiral it though, otherwise it would reach a point where it could be translated as pain. I felt that fine line where I had a choice between translating the sensation as pain or pleasure. But I just kept choosing to move it through, which kept it as pleasure. “There was a moment in labour when Nissam and I had the sweetest kiss and I felt that kiss go all the way through me. After that kiss I felt so soft and through each rush I was having I was actually purring through what they call ‘contractions’, but no way did I feel ‘contracted’ – I felt so ‘expanded’. I felt softer and softer till I just felt them coming through as rolling orgasms. I was almost crying it was so overwhelming. “Over a period of 9 months inside the mother, everything matters” says Elena. “All the expectant mother’s experiences during this time send a powerful message to the baby with volumes of information about the outside world. Her feelings, her relationship with the father of the baby, her diet, her social life, everything plays a part in this very delicate, complex, organic physiological process. The baby’s sensory apparatus is on. At 9 weeks, the baby’s system generates over 2 million neurons every minute, absorbing a wide range of outside influences. These early imprints are embedded into the baby’s subconscious mind and influence deep behavioural patterns for the rest of their life. “The journey from the womb, out into the world, whatever form it takes reinforces that imprint. In addition our early impressions in life also have an enormous impact on our future capacity to experience intimacy and love. We come into this world wide open to give and to receive love. And when that is our primal experience our nervous system is hard-wired for the undeniable rightness of being. If our early impressions are anything less than loving, then that ‘anything’, imprints in our nervous system as a valid experience of love, regardless of how painful those experiences might have been. Throughout our life, we unconsciously recreate the conditions and feelings that were imprinted at birth and in early childhood. Because of in spite of all logic, that is our comfort zone.” On the other hand, the baby that is birthed gently, received into loving hands, placed skin-to-skin on his mother’s body and then nurtured and loved as a baby, receives a positive imprint that will be with him, helping him to seek out healthy and loving relationships throughout life. “If in the process of attempting a waterbirth at home, it becomes obvious that there is a need for medical intervention, the birthing couple has to quickly move to a nearby hospital. It is important to recognise that necessity, and surrender to receiving help is not a failure”, says Elena. Conscious birth can take place in a hospital too, if we treat the birthing mother and her newborn baby with gentleness, love and respect. There is no way that words can convey the message of the Russian waterbirths, but you can buy the videos. The original film footage smuggled out of Russia when it was all happening. What it lacks in quality, it makes up for by taking us through the magic of what was happening at the Black Sea. This DVD offers 2 presentations about waterbirth in Russia and the USA. The 25-minute presentation is excellent for showing to mothers’ groups and childbirth classes. The 40-minute presentation includes material on caesarean sections, circumcision and how to resolve perinatal trauma. This entry was posted in Birth and tagged babies, birth, bonding, home birth, unborn baby, water birth. Bookmark the permalink. I’m due to give birth at end of August… are the birthing camps still open? I heard they had closed down . Hi Jo, Yes, I am afraid the birth camps (which were in Russia) were in the late 1900s. But the word spread, and depending on where you live, it is usually possible to find a private midwife who will give you a home water-birth (inside or outside, depending on the weather). In some places where the sea is warm enough, like Hawaii, women do give birth in the sea.